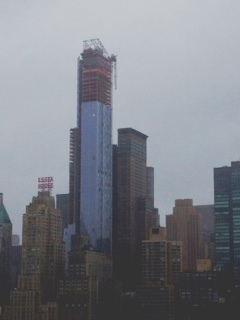 During Hurricane Sandy, a tower crane at One57 construction site snapped backward during the 80-mile-per-hour winds and the 150-foot boom stayed tied to the mast, dangling dangerously nearly 1,000 feet high in the air over midtown Manhattan. The team of inspectors and engineers that responded to this crane accident and helped secure the collapsed boom recently received the Advancing Public Safety Award at the 2013 Commissioner’s Awards for Excellence, the New York City Department of Buildings annual ceremony held at Cooper Union in Manhattan. After the collapse, Assistant New York City Department of Buildings Commissioner Michael Alacha, P.E., and Acting Assistant Commissioner Timothy Lynch, P.E., climbed to the top of 74-story unenclosed building to inspect the boom. In the following days multiple inspections of the crane, the hoist and the surrounding buildings were conducted and the two men as well as Executive Director of Cranes and Derricks Division Faisal Muhammed, P.E., Chief Inspector Frank Damiani and other engineers worked with the contractor and developer to devise a plan to secure the equipment. The entire operation lasted 5 days including 36 hours to slowly turn the crane mast sideways so the boom could then be secured.